OXID eXchange | Web Security - wao.io 1.0 | Stable | CE | 4.1.x - 6.1.x | Module, Themes, Language Packs direkt herunterladen! wao.io adds security to your running business. Implement web application security measures at the push of a button. Protect your website and your users from a wide range of attacks like clickjacking, cross-site-scripting or SQL injection. 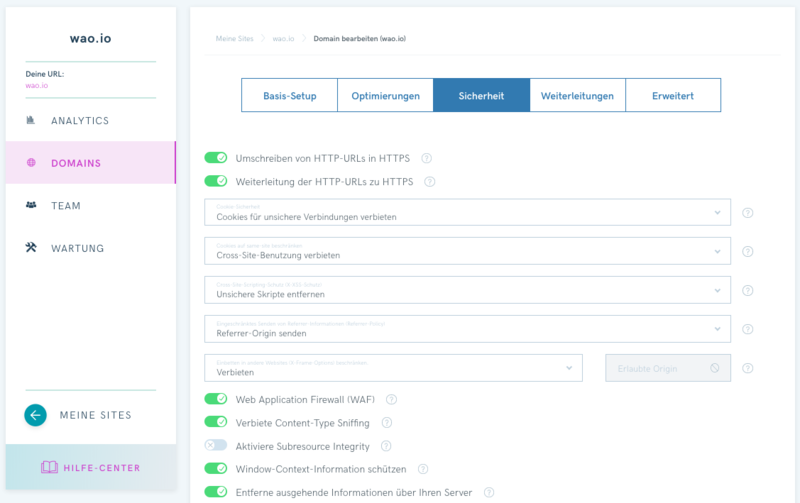 wao.io will automatically add HTTPS to your website. Secure your users and show instantly that you can be trusted. Protect your application from a wide range of attacks with enabling an extra web application firewall. Add another layer of security and mitigate attacks and security vulnerabilities from your user's browsers.